A search for the definitive pasta sauce uncovers a singular truth: There are as many versions as there are Bolognese people. In the stainless-steel kitchen of a modern building that towers over Michigan Avenue, Spiaggia chef Tony Mantuano bends over the stove, engaged in a ritual that has occupied Italian grandmothers for centuries. He's smelling the ground meat, onions, celery and carrot that are the start of a ragu alla bolognese, the king of Italian pasta sauces. "This is about purity and simplicity, " Mantuano said. "You want to get slow-cooked vegetables. That's where you get the flavor." It was that wonderful flavor that drove me, on a recent trip to Italy, in search of the secret to a perfect ragu. By the end of a weeklong pasta-fueled journey, I had yet to exhaust my enthusiasm for bolognese sauce. The secret proved elusive, however. 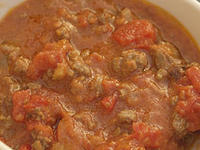 There is no single "correct" way of cooking ragu, or meat sauce. And Italian cooks still argue heatedly over the ingredients and methods involved in making this classic dish.